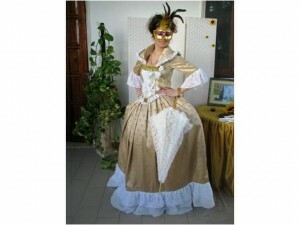 Venetian carnival masks have a long history . 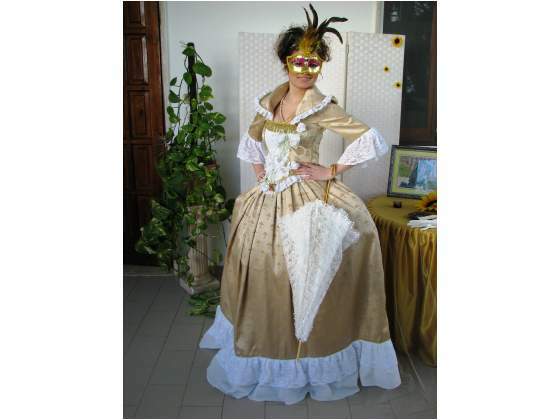 The Venetians have always had the habitude of wearing carnival masks and fancy clothes , not just during the Carnival period , but also on many other occasions during the year. .Of course the reason that made them dress up and hide their faces with carnival masks in particular times and places was obvious ;they did not want to be recognized.The women disguised themselves with carnival masks not only to not be recognized , but also to have a better conspicuousness They disguise themself when they gambling at “Ridotto”gambling house,because they wouldn’t be recognized by their creditors who gave them no respite. 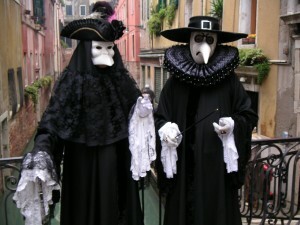 The term derives from the verb ” behuten “,a German word seems : to protect the wearer ,or from the esclamation ” bau ” (or ” bogey” ) , a typical Italian representation of the monster, beast or bad ,used by adults to frighten the childrens.The mask have a black veil ( also white or blue and even scarlet ) called ‘ cloak ‘ or ‘ little cloak ‘ , which, starting from the neck covers the shoulders . 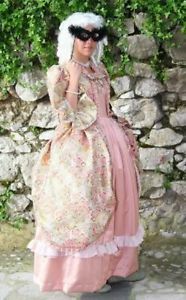 It is the same type of dress for everyone , easy to confuse the different social classes.The cloak or mantle was a little dress owned by everyone from the poor to the aristocrats, weared by strangers but also by the robbers. The mask was completed by a black tricorn hat and a white mask enlarged and protruding upper lip under a protruding nose like a beak. The projection of the nose and cheekbones ” pointed” on the sides were also a convenient way to remove the mask ,and to keep it on hand.That kind of conformation became a soundboard, changing the timbre of the voice , thus making the wearer unrecognizable. The white mask was called ” larva “, perhaps derived from the same Latin word whose meaning like a shadow / ghost.In the past the ” larva ” masks were made by famous craftsmen from those days, it was made ​​from stucco, papier-mâché or leather .The sizes had been in accordance with the comforts and the features of the face , but at the same time had to be in ” standard “, maintaining the constancy in the forms and colors, to be confused with other carnival masks. You could eat and drink without removing it , thus maintaining the anonymity.After all this, it was the custom to wear a long black cloak that covered half of the body . During the Carnival , the Venetians used the bauta to maintain their anonymity ( granting any transgression ) and let them enjoy the fun. The Bauta mask ,was used both by men and women on different occasions : it was even obligatory for the married women who went to the theater while it was forbidden to the young girls at the ” age of marriage”.Even the priests and the nuns used that kind of mask to hide their forbidden love stories . It was introduced in theater by Carlo Goldoni in 1748.In many buildings with frescoes by Tiepolo you can recognize pictures in which appear the old bauta masks. 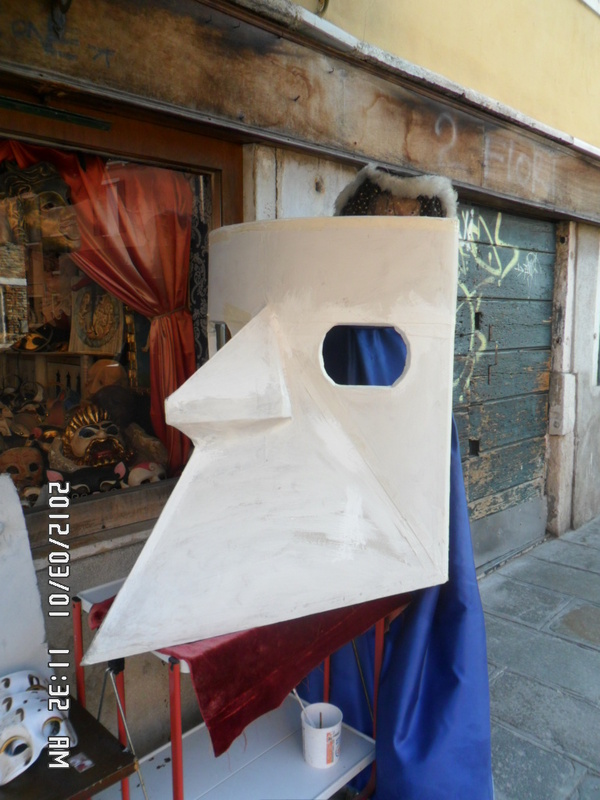 Gnata is a Traditional Venice Carnival mask , a disguise as a woman for men , easy to implement and with fairly common use. It was made ​​up of women’s clothing in common use, a white cap and a mask with the likeness to a cat, accompanied by a basket ,on the arm ,that usually contained a kitten. The character is posing as a commoner small woman , uttering shrill sounds mocking and meows . Sometimes they wore garments of mercy , accompanied by other men dressed as children . 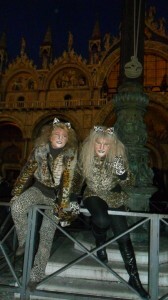 The cats were so scarce in Venice that have become the subject of the wide discution . 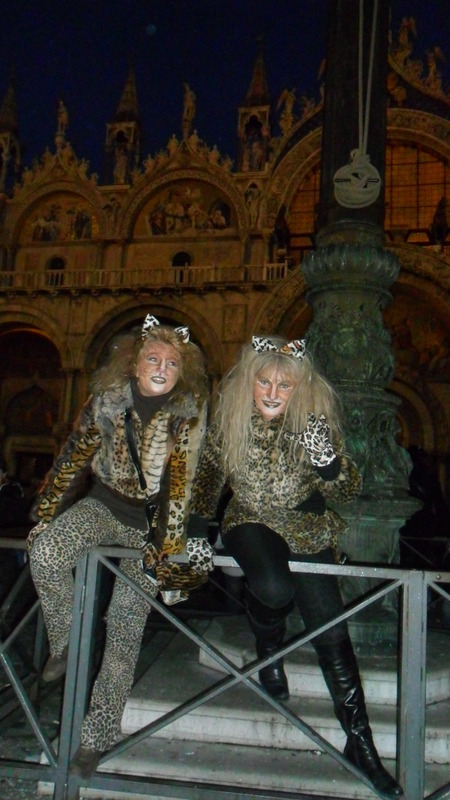 Legend tells us that a man who owned nothing that his old cat came to Venice from China. The man became rich when the cat free,the Doge’s Palace from all its mice. When he returned home , rewarded by the Doge himself, his rich neighbor, full of envy , rushed to Venice with its most precious silks, thinking that if a simple cat did the other man rich , he would be greatly rewarded for all these precious objects. In fact , the Duke had promised , his most precious possession in exchange for objects and gifts … and the cunning neighbor came home with the …precious cat! This mask offered the opportunity to hide the nature, of many young boys ,who went around dressed as Gnaga , to cover up their homosexuality. The behavior was very common among the young people (monitored by the state inquisitors .) The government attributed the bad habit to the influence of other peoples , especially the Turks, who were famous for this bad habit.From that mask derived an Venetians expression “ti ga na vose da Gnaga ” to indicate the tone of a shrill voice . “On May 4, 1740 during a “regatta” held in honor of Frederick, King of Saxony, a boy masked as Gnaga, from a boat, began to teasing of the Turks who were leaning out the windows on the place called the “turkish fundament” : these , irritated, began to react first with words , then , at the inceasing insults , uncovering the roof and stoning Gnaga with tiles,dropping off the entire cover of the building ” . an oval mask of black velvet that was usually worn by women visiting the convents.Over the mask usualy ,could put a veil.This mask ,a traditional Venetian mask, could be worn by women throughout all the year. Used mainly by young women, the oval black mask, was accompanied by a poor dress ,like a simple servant who hid the identity of a noble woman in search of transgressions. The mask was devoid of the hole of the mouth , and was supported by a button placed inside with the teeth .The mask forced to not speak , which in those days was recommended to a not accompanied lady. Invented in France the mask quickly became popular in Venice, showing the beauty and the femininity of a lady.The strange thing is that the mask was preferred by many men . 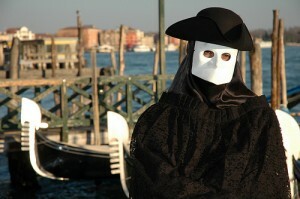 Dr. peste is a modern Venetian Carnival Mask . This mask had a very peculiar story: On of the worst scourges of the city of Venice was undoubtedly the plague that struck the city on several occasions. Because of this plague, this strange costume was used as a disguise to recognize physicians who came to visit the sick patients,the strange dress was of French invention,and at the time represented the maximum prevention.The dress consisted of the doctor’s hat ,to show that the man was a doctor, a mask to protect the face, including” the crystal” eyes to protect the wearer’s eyes and a beak stuffed with spices or herbs to purify the air that the doctor breathed.The costume was completed with a wooden stick to push away the victims who get too close to him , a pair of leather gloves to protect his hands , a gown waxed from the outside, and long boots. the mask has many variants correspond to the elegant ladies of the sixteenth century covered in jewels, expensive clothes and processed headgears .Le ladies used to wear white wigs high hairstyles with very elaborate or elegant hairstyle with curls and braids, with a hat of the same shade of gown embellished with colorate feathers. The extremely elaborate dress, with the skirt very wideand large,the quality fabric,colorful and full of lace and decorations aroused the admiration of all who watched. The mask , in tune with the whole costume have a holder to keep it before the face and hide to the anonymous. In our days,this is probably the most popular type of mask, with the most beautiful effect, used during the Carnival of Venice.